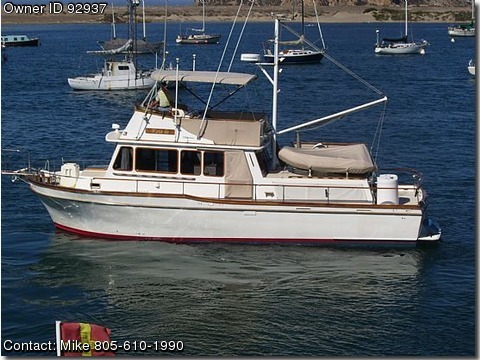 Call Boat Owner Mike 805-610-1990 Californian GENERAL: The Californian trawlers handle rough weather well yet are easily driven. Her low freeboard and low profile superstructure will not provide enough windage to cause instability or compromise maneuverability. She is powered with reliable and economical Caterpillar diesels. CONSTRUCTION: Fiberglass Hull: hand laminated fiber reinforced polyester in a female mold Deck: painted hand laminated FRP, marine plywood cored, applied non-skid Cabin: in deck mold, marine plywood backed Cabinetry: mahogany and mahogany marine plywood Keel: molded with hull Rudders: cast bronze on stainless steel posts ACCOMMODATIONS: The main salon has an "L" settee with table aft to starboard, steering station forward to starboard, and to port is the galley with 3 burner AC stove and oven, microwave oven, dual stainless steel sinks, and two dual voltage refrigerator/freezer units and ice maker. Down forward to port is and enclosed guest head having electric toilet, shower stall, and sink. To Starbaord is an over and under guest cabin with escape hatch over. Down and aft from the salon is the master cabin with twin berths port and starboard and en-suite head with electric toilet, sink, and shower stall/tub. MACHINERY AND EQUIPMENT: PROPULSION: 2 Caterpillar V-8 @ 210 hp. Port: Model#: 3208-N Serial#: N/A Hours: 5169 by meter Stbd: Model#: 3208-N Serial#: N/A Hours: 5181 by meter DRIVE: hydraulic reverse/reduction marine gear 1 3/8" stainless steel shafts, intermediate bearings 23x23 bronze four blade propellers AUXILIARY: Onan 9 KW 3 cyl. diesel/AC generator set Mdl.9MDKAV Serial#: K0305 72913 Hours: 1121 by meter STEERING: 2 stations, wheel via hydraulics to tied tiller arms TANKS, Fuel: 500 gallons in 4 aluminum (new) and Racor fuel filters Water: 150 gallons in FRP tank Waste: holding: 60 gallons (est.) in 1 FRP PUMPS: DC bilge, DC/automatic bilge, DC bait, DC raw water wash down DC/automatic fresh water pressure demand system DC macerator waste discharge, DC shower sump ELECTRICAL: 12 volt DC system and 120 volt AC ship/shore power system 3- 8-D 12 volt L/A batteries 1 group 27 12 volt L/A battery (generator set dedicated) Battery switches: 3- House , port eng. start and gen. set Fused switch panel: navigation lights, cabin lights, deck lights, remote spot light silicone diode automatic multi bank marine battery charger AC/DC refrigerator/freezer unit, AC range, AC microwave oven AC fresh water heater, AC ice maker, AC trash compactor DC and AC voltmeters, digital power meter ELECTRONICS: Type/Maker/Model; GPS/Plotter: Garmin multi function color 4208, / GSD 22 sounder @ bridge (new) GPS /plotter: Garmin color 2010C @ helm w/ data card Transceiver: VHF /Uniden/MC-680 @ helm; VHF-RDF/Regency/Polaris @ bridge Radar: Furuno/1832 48 mi. @ helm; Furuno plotter /FMD-811 @ bridge Auto pilot: Robertson/AP-16 with repeater @ bridge Sea Temp: Dytek/ST 500; SAFETY GEAR: 3ea 3 lb. Halon portable fire extinguishers 1ea 2.5 lb. dry chemical portable fire extinguishers 28 lb. Halon automatic engine compartment fire extinguisher 6 adult and 1 child personal floatation devices, Type IV life ring perimeter safety rail, flying bridge rail, handrails bilge ventilation exhaust blowers, horn and bell, flare kit, first aid kit GROUND TACKLE: 20 kg. Bruce anchor, 300' chain (est.) DC electric windlass.